Updated on 3 Dec 2018 with better photos and directions – the proportions in the recipe remains the same! 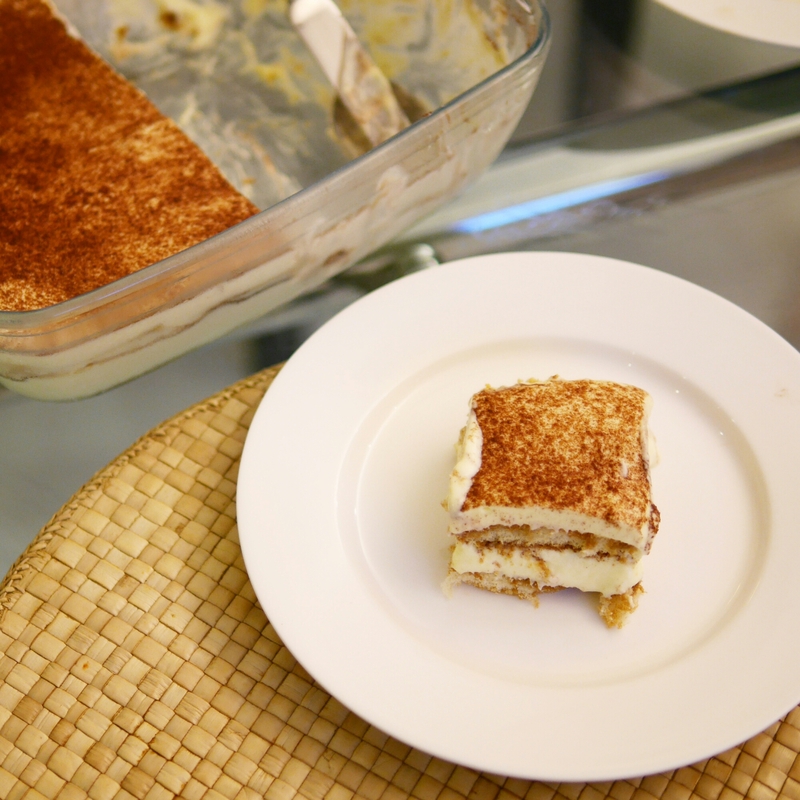 Tiramisu has long been my favourite dessert and with this motivation, it became the first dish I ever mastered. It probably strays a little away from the most traditional Italian tiramisu, as I tailored the recipe to my personal taste preferences. The texture of the creamy layers are more fluffy, and less heavy. It has strong mascarpone cheese flavours, high ratio of cream to lady fingers and is not too sweet. It also omits brandy. I found that the omission of brandy helps accentuate the espresso coffee flavours. Although the proportion of ingredients help shape the taste of this cake, getting the technique right is also important to churn out a tiramisu with a thick creamy texture. As a side story: among our friends, we joke that it’s the “sweatpants tiramisu”. At a casual dinner party, a friend went for a second helping, but dropped it on her sweatpants. It was the last piece and it was so good, she still ate it from her sweatpants! Tip: Buying good quality mascarpone cheese, though more expensive, is important. Tiramisu has always been my favourite dessert. After perfecting this recipe over the years, my family and I rarely enjoy tiramisu at restaurants now. This version has an extremely smooth and creamy texture. It carries a strong mascarpone flavour, but is less heavy than the traditional Italian recipe. I omit alcohol, as this helps the aromatic coffee flavours stand out. Separate the egg yolks from the egg whites (we only need the yolks). Mix egg yolks with white sugar in a large mixing bowl. Place over bain-marie and slowly mix with a whisk for about 10 minutes to sterilise the raw eggs. What's a bain-marie? You essentially rest the mixing bowl (heat proof) on a pot, with simmering water (make sure the bottom of the pot is not touching the water. This helps "cook" the eggs with low heat, so they are sterilised but don't become scrambled eggs. Take the bowl off the heat and beat with an electric whisk for about 5 minutes, until pale yellow. The mixture should thicken a little and look creamy in texture. Add in the mascarpone cheese and beat with an electric whisk briefly, only until just incorporated. In a separate bowl, whisk the whipping cream until hard peaks form. The cream is watery and liquid-form when you pour it out from the packet. After beating for about 2-3 mins, it will start to thicken and eventually thicken into “whipped cream”. Tip: When should you stop beating the cream? For your first time, regularly stop whisking to check that when you tilt the bowl, the cream doesn’t slide out. Don’t overbeat it – the tiramisu texture will turn rough. Gently fold the whipped cream into the mascarpone cheese/egg mixture. Cut the ladyfingers lengthwise and lay them onto the bottom of a container/tray. Brush some espresso onto the ladyfingers. Pour in half of the cheesy cream mixture from Step 5. Sprinkle cocoa powder evenly. Repeat the previous two steps, so you get two layers. Refrigerate overnight to let the cream set. If you’re impatient, 4 hours is enough, though the mixture may still be a tad runny. A number of friends have also remade this recipe with success! But if you have any questions or suggestions, please do leave a comment below.